As a DevOps engineer, you’ve achieved greatness. You’ve containerised everything, built your infrastructure and systems in the cloud and you’re deploying every day, with full test coverage and hardly any outages. You’re even starting to think you might really enjoy your job. Then why are your compliance teams so upset? Let’s take a step back. You know how to build secure applications, create back ups, control access to the data and document everything, and in general you’re pretty good at it. You’d do this stuff whether there were rules in place or not, right? Not always. Back in the late 90’s, a bunch of guys in suits decided they could get rich by making up numbers in their accounts. Then in 2001 Enron filed for bankruptcy and the suits went to jail for fraud. That resulted in the Sarbanes-Oxley Act, legislation which forced publicly listed firms in the US to enforce controls to prevent fraud and enable effective audits. Sarbanes-Oxley isn’t the only law that makes us techies do things certain ways though. Other compliance rules include HIPAA, ensuring that firms who handle clinical data do so properly; GDPR, which ensures adequate protection of EU citizens’ personal data; and PCI-DSS, which governs the use of payment card data in order to prevent fraud (and isn’t a law, but a common industry standard). Then there are countless other region and industry specific rules, regulations, accreditations and standards such as ISO 27001 and Cyber Essentials. Aside from being good practice, the main reason you’d want to abide by these rules is to avoid losing your job and/or going to jail. It’s also worth recognising that demonstrating compliance can provide a competitive advantage over organisations that don’t comply, so it makes business sense too. The trouble is, compliance is an old idea applied to new technology. HIPAA was enacted in 1996, Sarbanes-Oxley in 2002 and PCI DSS in 2004 (though it is frequently updated). In contrast the AWS EC2 service only went out of beta in late 2008, and the cloud has we know it has been around for just a few years. Compliance rules are rarely written with cloud technology in mind, and compliance teams sometimes fail to keep up to date with these platforms or modern DevOps-style practices. 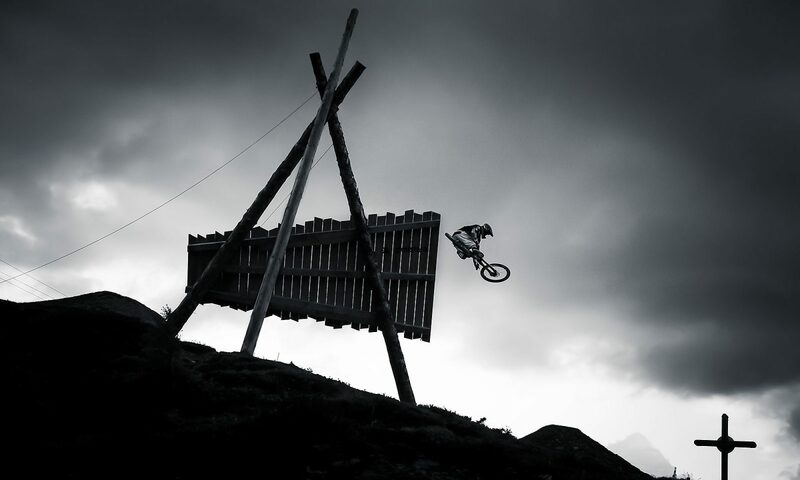 This can make complying with those rules tricky, if not downright impossible at times. How do you tell an auditor exactly where your data resides, if the only thing you know is that it’s in Availability Zone A in region EU-West-1? (And don’t even mention to them that one customer’s Zone A isn’t the same as another’s). This is because when an audit is announced, the pressure is suddenly on to patch the systems, resolve vulnerabilities, update documents and check procedures. 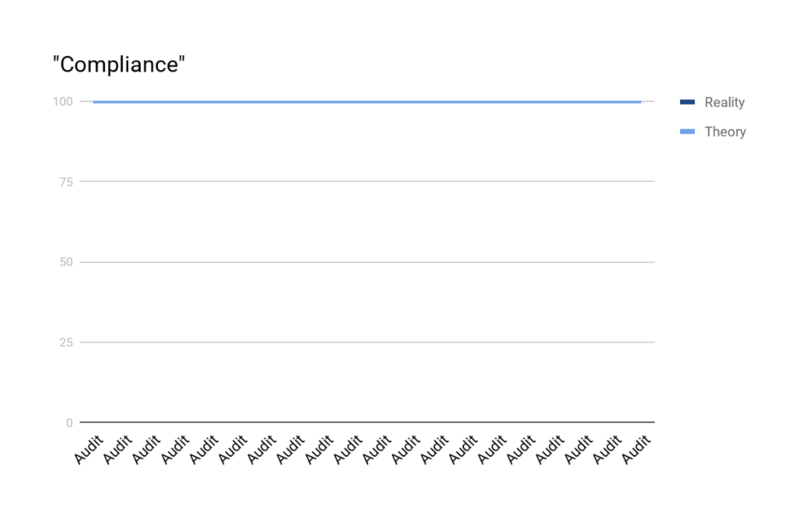 Once the audit is passed, everyone relaxes a bit, patching lags behind again, documentation falls out of date and the compliance state drifts away from 100%. This begs the question, if we only become non-compliant between audits, is the answer to have really, really frequent audits? In a sense, yes. However, we can no longer accept that audits with spreadsheet tick box exercises, and infosec sign-off at deployment approval stage actually work. Traditional change management and compliance practices deliberately slow us down, with the intention of reducing the risk of mistakes. This runs counter to modern DevOps approaches. We move fast, making rapid changes and allowing teams to be autonomous in their decision making. Cloud technology confuses matters even further. For example, how can you easily define how many servers you have and what state they’re in, if your autoscaling groups are constantly killing old ones and creating new ones? From a traditional compliance perspective, this sounds like a recipe for disaster. But we know that making smaller, more frequent changes will result in lower overall risk than large, periodic changes. What’s more, we take humans out of the process wherever possible, implementing continuous integration and using automated tests to ensure quality standards are met. From a DevOps perspective, let’s consider compliance in three core stages. The first pillar represents achieving compliance. That’s the technical process of ensuring workloads and data are secure, everything is up to date, controlled and backed up. This bit’s relatively easy for competent techs like us. 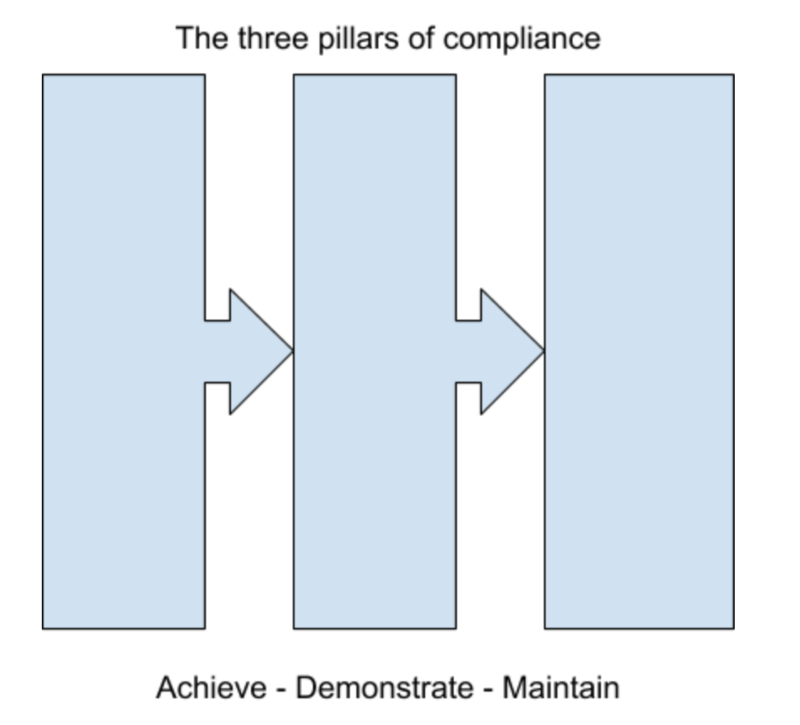 The second pillar is about demonstrating that you’re compliant. How do you show someone else, without too much effort, that your data is secure and your backups actually work? This is a little more difficult, and far less fun. The third pillar stands for maintaining compliance. This is a real challenge. How do you ensure that with rapid change, new technology, and multiple teams’ involvement, the system you built a year ago is still compliant now? This comes down to process and culture, and it’s the most difficult of the three pillars to achieve. But it can be done. In DevOps and Agile culture, we shift left. 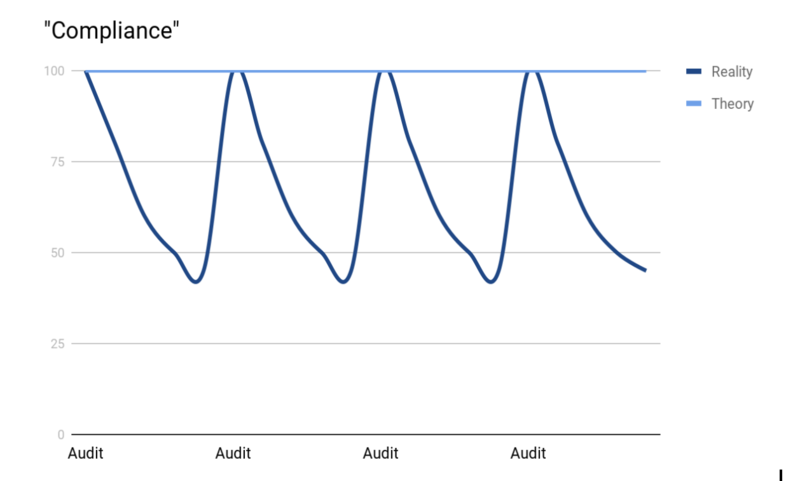 We shorten feedback loops, decrease batch size, and improve quality through automated tests. This approach is now applied to security too, by embedding security tests into the development process and ensuring that it’s automated, codified, frictionless and fast. It’s not a great leap from there towards shifting compliance left too, codifying the compliance rules and embedding them within development and build cycles. First we had Infrastructure as Code. Now we’re doing Compliance as Code. After all, what is a Standard Operating Procedure, if not a script for humans? If we can “code” humans to carry out a task in exactly the same way every time, we should be able to do it for machines. Technologies such as AWS Config or Inspec allow us to constantly monitor our environment for divergence from a “compliant” state. For example, if a compliance rule deems that all data at rest is encrypted, we can define that rule in the system and ensure we don’t diverge from it – if something, human or machine, creates some unencrypted storage, it will be either be flagged for immediate attention or automatically encrypted. One of the great benefits of this approach is that the “proof” of compliance is baked into your system itself. When asked by an auditor whether data is encrypted at rest, you can reassure them that it’s so by showing them your rule set. Since the rules are written as code, the documentation (the proof) is the control itself. If you really want your compliance teams to love you (or at least quit hassling you), this automation approach can be extended to documentation. Since the entire environment can be described in code at any point in time, you can provide point-in-time documentation of what exists in that environment to an auditor, or indeed at any point in time previously, if it’s been recorded. By involving your compliance teams in developing and designing your compliance tools and systems, asking what’s important to them, and building in features that help them to do their jobs, you can enable your compliance teams to serve themselves. In a well designed system, they will be able to find the answers to their own questions, and have confidence that high-trust control mechanisms are in place. This is what continuous compliance looks like. Achieve this, and you’ll see what a happy compliance team looks like too. Work in IT? Here’s how to ask for a pay rise. Either ask for a review or 1-1 with your manager, or wait until the next scheduled one. I’d prefer one of my team to ask me for a chat about salaries rather than ambush me with a request, but whatever works with your company culture. What have you achieved in your role in the business, and what benefit has that returned? Ignore your standard duties – that’s what you’re employed for anyway. If you do something that clearly makes/saves the business £100k pa, a few k raise is an easy decision. What’s the pay grade for your job across your industry? If you’re good, I don’t want to lose you just because I didn’t pay you enough. Equally, be careful of earning over industry average – you’ll be stuck in a job. Be aware of any mistakes or failures you’ve had. It’s no good shouting about the £100k project you managed if you also ran one that lost £150k. Look at the financial status of the business. If the business is doing well and has turned a sizeable profit, highlight it. This not only shows that the business could afford to give you the raise, but that you’re savvy enough to understand the commercial world you operate in. If the business turned a loss, be very wary of asking for a raise. Have a backup plan. Could you ask for an additional training course? A performance-related bonus instead of a flat raise? If times are hard for the business, could you suggest a post-dated raise, or extra holiday in lieu of pay? Be aware that with a raise comes extra responsibility. Don’t make your manager regret their decision to invest extra money in you. If taking that raise means working an extra few hours a week and extra pressure to hit targets, do you still want it? Play the long game. Don’t suddenly start putting in a few extra hours here and there a few days before you ask. Be consistently excellent long-term. Be aware of the rest of your team. It’s potentially worth suggesting not just a raise for yourself, but a blanket raise for the team, or certain members. Do you want to be the one on £10k more than your team-mate? Ultimately, make the decision easy to make for your manager. They’re going to have to justify it in their budget, and potentially go to ask their boss for the money to pay you anyway. They don’t want to regret their decision. Finally. Don’t forget to actually ask for the pay rise. An SPF record is a DNS TXT record (like A records and MX records) that indicates to receiving mail servers whether an email has come from a server that is “allowed” to send email from that domain. I.e. it’s a check that should prevent spammers impersonating your domain. It does rely on the receiving server actually doing the check, which not all do, so it’s not by any means fool proof, but it should help prevent mass email from your organisation to customers being flagged as potential spam. Ip4: pass if the IP senders IP address matches the addresses we send mail from. Mechanisms are tested in order and any match will pass the email. A non-match results in a neutral state, until it gets to the end of the string where the –all mechanism will fail it. 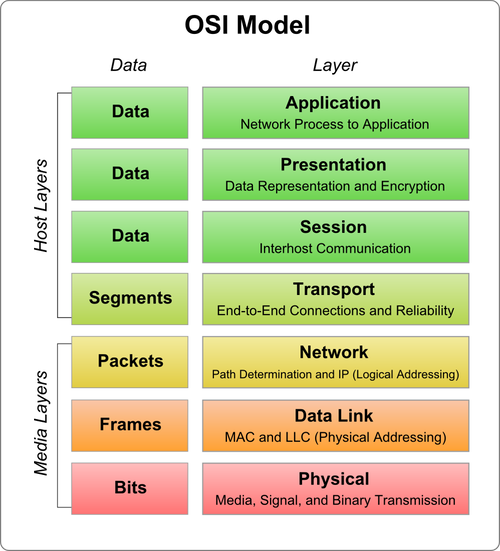 Through March 2013, I’m running a set of IT and Web infrastructure masterclasses in Nottingham (in conjunction with PCM Projects), for people who don’t necessarily work in IT, but need to know (or would benefit from knowing) some of the basics. The intended audience is small business owners or managers, where you may have to deal with IT contractors or staff and decide IT and web strategy, but you’re not comfortable that you know enough about it to make informed decisions. For example, there are an almost infinite number of ways to keep your business data accessible, secure, backed up, and away from prying eyes, but which way is best for you? How should you manage your website – should you pay someone else to design and host it, or bring it in-house? How should you handle email, on what sort of server? How should you plan for business growth? How do you protect your business from viruses, malware, spam, and hacking attempts? These are the sort of questions that I will help you with – you don’t need any knowledge of IT or the web already, and because the groups are small – around 6 people – you’ll be able to ask questions and find out information specific to how your business operates. You’ll then have enough knowledge to go to your suppliers or contractors, and ask the right questions, purchase the right services, at the right price. There are four sessions, as below, and you can book yourself on them by visiting the eventbrite page for the events. Contact me for any further information. Topics to include: an overview of web/IT infrastructure and how it all fits together; an update on the current climate; domain names, analytics, and connections to social technology. Topics to include: different service providers and set-ups (e.g., using hosted email, managing it in-house) and getting it all working for PCs and on mobile devices; good email practice, transferring data and keeping it secure. Topics to include: how to stay safe and keep trading; what are the threats – viruses, hack attacks, theft, loss of confidential or valuable data; keeping your business (and family) safe on the internet; and keeping your systems up to date and secure. Topics to include: managing data storage and growth in your business; internal networks and cloud storage; back-ups; access controls, speed vs. reliability vs. cost. In a “normal” (read: physical) domain environment, all the domain member machines such as servers and PCs use the PDC (Primary Domain Controller) as the authoritiative time source. This keeps all the machines in a domain synchronised to within a few milliseconds and avoids any problems due to time mismatch. (If you’ve ever tried to join a PC to a domain with a significantly different time setting, you’ll see how this can affect active directory operations). If you run the same command on the host itself, it’ll just return the name of one of the domain controllers in your network (probably, but not necessarily, the PDC). 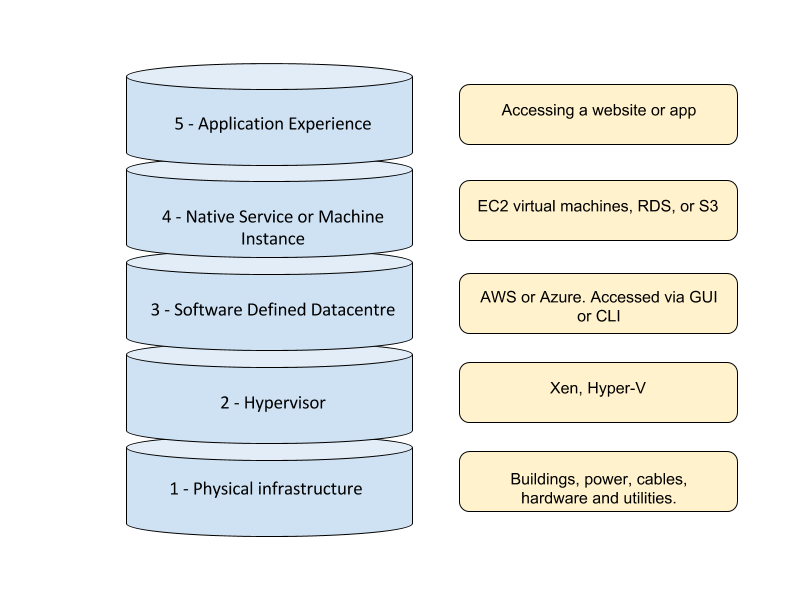 Now, what if your domain controllers are virtual? They’ll be using their host machine’s time as the source, but the hosts themselves will be using the PDC as an authoritative time source – the problem is clear: they’re using each other as authoritative time sources and network time will slowly drift away from the correct time. You may decide to disable integration services for the guest (the PDC), and configure an authoritative external time source, but if the PDC is rebooted or goes offline and comes back online with a different time than the host (such as a restore), you’ll have problems. Granted, this should fix 90% of issues, but I wouldn’t recommend it as a solution. In an ideal world, you’d still have at least one physical PDC, which would use an external time source, and would serve time to all other machines in the network, but if your infrastructure is such that you only have virtual domain controllers, you’ll need to do something a little different. The best way to this is to set your virtual hosts to use the same external (reliable) time source. This does of course require that your virtual hosts have access to the internet, but at least you should be able to add firewall rules to enable access to a fixed range of NTP servers, which should pose no security threat. 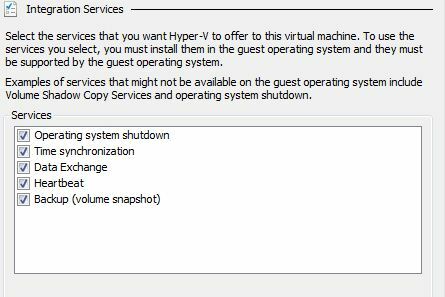 To do this, log on to your (windows) virtual host (in this case, I’m using Hyper-V server 2008 R2). And it’ll return one of the domain controllers. Use the command prompt to open regedit, and navigate to HKLM-System-CurrentControSet-services-w32time-parameters. Change the “Type” entry to “NTP” and if you desire, change the NtpServer entry to something other than windows time, although you can leave it if you wish. And it should return the new internet time servers. to force a resync of the machine’s clock. Log on to the virtual machine running on this host, and check the time. Force a resync if you want – it won’t do any harm, and at least you’ll know it’s synced. This command instructs the machine to search for and use the best time source in a domain hierarchy. I set a limit of 6000 because we have almost that many mailboxes, and the limit in this case is the number of mailboxes this will query, rather than the number of actual results. I’m sure this means that there’s a more efficient way of running this query, but it’s not like you’re doing this every day, so it doesn’t really matter. Once you’ve got this information, you might want to match this up with further details about the users that own these mailboxes. Use the Active Directory powershell tools with Server 2008 to extract this information. Fire up a powershell on a domain controller (or remotely), and run “import-module activedirectory”. Than get this data into excel in two different worksheets. In your “working worksheet” make the first column pull the display name from the mail worksheet, then name the second column “description” (this is what I’m looking for, anyway), and the third columns can be any other data you’d like to show, such as OU, modified dates, or suchlike. “mail” refers to the worksheet containing data extracted from Exchange, and A2 should be the first user’s Name field (copy this downwards to that you’re looking up A3, A4, A5, etc. “allusers” refers to the Active directory information worksheet – so in this case it will attempt to match the mail A2 field with anything in the D column in allusers (this being the first column in the $D:$E array, and will then return the corresponding value from the E column in allusers (because I’ve specified “2”, which in my case is the description field.) The FALSE bit at the end ensures that you’re searching for an exact match. Copy this formula down along with the list of users that have email forwarding enabled, and you’ll have a list of forwarded users along with their names, descriptions, modified dates, OUs, and any other data you like.